Al-Qaeda’s September 2001 attacks on America put paid to that. You can still park in Canada and walk across the border to the front door. But now American officials watch to make sure you go back the same way. Elsewhere in the twin towns, movement has been curbed; gates have turned streets into dead ends. Although Derby Line and Stanstead share water and sewerage systems and a Rotary Club, they are no longer one community, says Brian Smith, a local politician. Many locals hesitate to cross the border to shop, worship or see friends–for fear of being detained and fined, as befell a local pharmacist who did not report to customs when he crossed over to get a pizza. “It’s not like it used to be,” says Mr Smith. The attack in Ottawa last month by a lone gunman, who killed a Canadian soldier and stormed parliament, seems likely to make matters worse. Although there is still uncertainty about the motives of the gunman, Michael Zehaf-Bibeau–possibly a deranged outcast, possibly a religious extremist–the United States is reviewing security along the 5,525-mile (8,890km) line which separates the two countries (including the Alaskan land border). It is debatable whether more security on what Senator John McCain recently called the “porous” northern border really will make Americans much safer from terrorism. 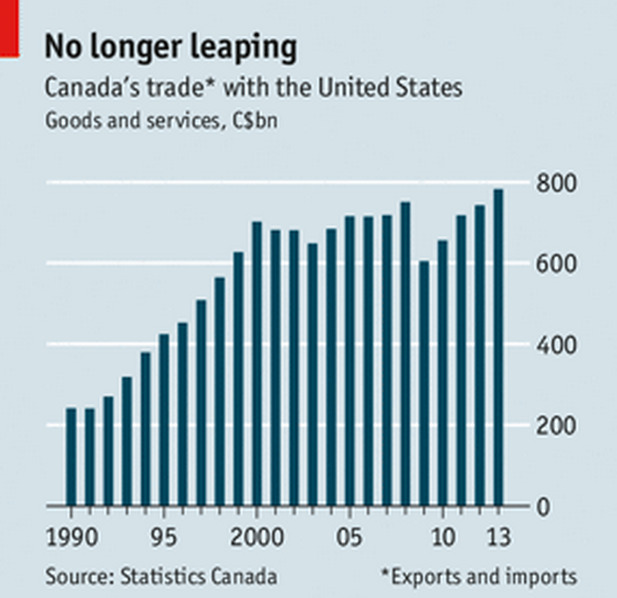 But it seems hard for politicians to shake off the habit of Canada-bashing. Both Mr McCain and Hillary Clinton (in 2004) have stated, wrongly, that the 9/11 terrorists entered American territory through Canada. An article on the politico.com website last month (before the Ottawa shootings) had the headline: “Fear Canada: the real terrorist threat next door”. What is more certain is that “tweaks and changes” will impede economic exchanges between two countries who are each others’ largest trading partners; and they may further fray social relations between once-friendly neighbours. Nik Nanos, a pollster who has tracked cross-border attitudes for a decade, says Canadians and Americans still like each other but have lost enthusiasm for further co-operation, most notably on terrorism. 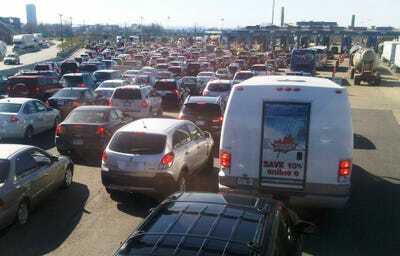 REUTERS/Hyungwon KangTraffic is backed up at the Canada-US border crossing in Buffalo, New York on Good Friday, April 6, 2012. Unlike the turbulent border with Mexico, the northern frontier usually gets little attention in the United States. It “just doesn’t squeak as loud as the southern border,” says Paul Frazer, a consultant on diplomatic affairs. Jeh Johnson, homeland-security secretary in the United States, gave a speech on “Border Security in the 21st Century” last month in which the only allusions to Canada were about the 1920s. Still, comparisons with Mexico can understate the difficulty of policing a line which runs through remote spots like the hills of Montana and Alberta (pictured) and four Great Lakes. There has been a rise in security measures since 2001. The number of American border agents looking atCanada seems paltry, at about 2,200, compared with 18,600 dealing with Mexico; but the former figure was only 340 in 2001. Since that time the United States has also added aircraft with sensor arrays, thermal cameras, video surveillance and unmanned aircraft to watch remoter areas. Aaron Heitke, deputy chief patrol agent in Montana, says that when he started 13 years ago his main item of equipment was binoculars. Now, in addition to his weapon, he has a radiation detector, night goggles and thermal imaging. Perfect security is impossible. Ross Finlayson, a member of a globe-trotting club, trekked through wild terrain from Montana to Canada last summer, bringing a passport and some anti-bear spray. Neither proved necessary. Canada has assuaged some American concerns–by arming 5,685 customs officers; agreeing to joint patrols on the Great Lakes; and helping to form teams that include coast guards, border agencies and police from both countries. By one estimate, Canada spent an additional C$92 billion ($US77 billion) on security in the ten years after 9/11. On November 4th it announced a new surveillance web, with radar, ground sensors and thermal radiation detectors, along 700km of the border. Yet while the United States sees the border through the lens of security, Canada thinks of bilateral trade worth $US2 billion a day. Businesses of all kinds moan that stringent procedures depress activity. Costs rise when lorries have to queue for hours to be inspected several times over. In the wake of the Ottawa shooting, Canadian businesses fear an overreaction, says John Manley, who heads a group representing the country’s largest firms. A shopping centre on Cornwall Island in the Canadian bit of Akwesasne, a piece of land set aside for the Mohawk people, shows how changing regimes harm small businesses. When the Mohawks objected to the arming of Canadian guards, Canada moved a customs post north to the mainland. This left the mall in no-man’s-land. 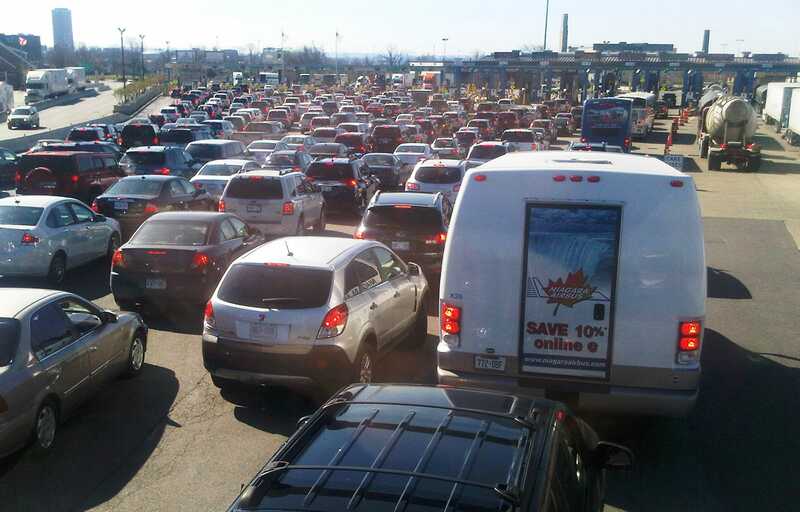 Travellers from the United States are now told not to stop until they reach Canadian customs. The change has cost the mall’s sports store C$50,000 a year and has made some units unrentable. Canada and the United States have made periodic efforts to ease the flow of goods and people: some cargo clearance has been moved away from the border, and American customs officers now work in some Canadian airports. Beyond the Border, a plan launched with fanfare in 2011 by President Barack Obama and Stephen Harper, Canada’s prime minister, aims to create joint perimeter security. But work on aligning standards and rules has been sporadic. Every resumption, such as a meeting last month in Washington, DC, is hailed unconvincingly as a new start. 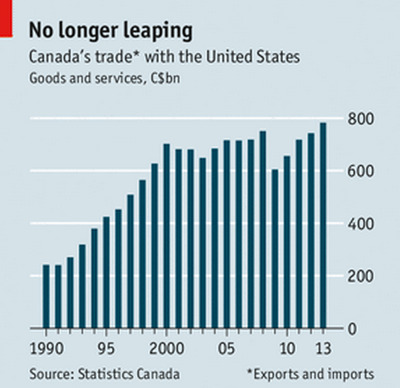 While Canada is keen, the other side lacks the will for a sustained push. Coolness between Mr Obama and Mr Harper hardly helps. Ms Rumery, the librarian at that cultural centre on the border, could see her nightmare come to pass–users having to clear customs to get through her door.